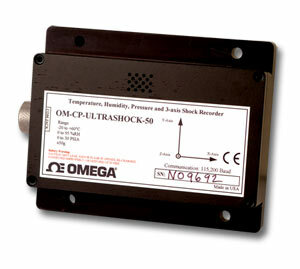 The OM-CP-ULTRASHOCK is specifically designed for documenting dynamic environments such as moving vehicles, trucks, containers, ships, etc. The device is also valuable in characterizing environments such as production and assembly lines of delicate electronics, IC fabrication, communications and computer components. 참고: Operator’s manual and interface cable included with OM-CP-IFC200 software/cable package (required for data logger operation; sold separately).